For the past few weeks I’ve been living in the basement of Pete and Susan… who the hell has a basement in NYC? Well they do and Tía Weezy has been hibernating there. Last night Pete made a delicious Manhattan of sorts while Perrin was having a meltdown from the lack of Dora the Explorer. Holy crap, these shows are crack rock for the kids!! 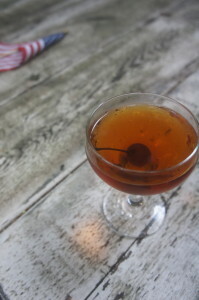 He put a few splashes of cognac in it to clean out a rogue bottle, shook it up, strained it into little coups and Happy Hour was in full force. We brainstormed on what to call it and decided that because it’s equal parts American and French, it reminded us of that gorgeous copper Lady that sits in New York Harbor. Quite elegant, delicious and unpretentious, it proved to be a great drink for this 4th of July. Throw it all in a shaker, let it rip and strain into a pretty little cocktail glass. 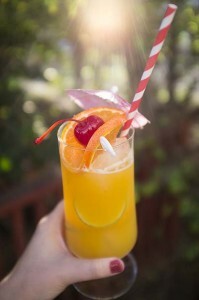 Fat Tuesday; the day before Lent (if you’re into that sorta thing), is a great excuse to tie one on midweek and there’s no better way to do that than with the Hurricane Cocktail. Transport yourself to one of my favorite cities, New Orleans, and throw on some Preservation Hall Jazz Band, make yourself a pot of gumbo and get this tropical drink flowing. I would recommend squeezing extras of the fresh juices for the morning after to bring yourself back to life. These puppies can sneak up on ya! In a shaker filled with ice, add all the ingredients except the fruit garnish and shake well. Fill a hurricane glass to the top with ice and strain the cocktail over it. Garnish with fruit and an umbrella. Cheers! *Homemade passion fruit syrup is best and and easy to make. Take 1 cup sugar and 1 cup water and bring to a boil. Scrape the pulp from 6-8 ripe passion fruit into the syrup or alternatively use 1-2 cups frozen passion fruit pulp and cook 1 minute more. Immediately chill and strain out the seeds. This will keep in the refrigerator for 2 weeks or can be frozen for later use. 5 minutes. Cool, then strain out solids. Pour 1 tsp. thyme syrup into bottom of each glass. 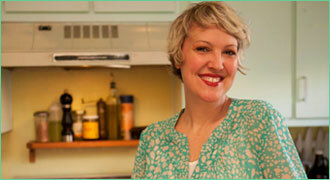 Fill glass three-quarters full with sparkling wine, then top with 1 oz. clementine juice and 1 oz. cranberry juice. Garnish with clementine zest and 1 thyme sprig. a replacement. Garnish with a dusting of cinnamon, if desired. 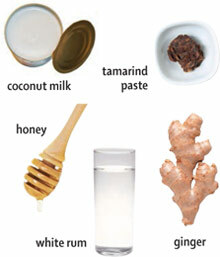 Blend all ingredients with 11/2 cups ice in blender 10 seconds, or until frothy. Divide among martini glasses, and serve. 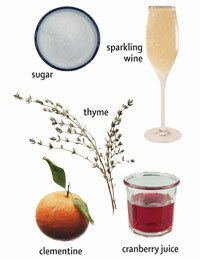 In this twist on the Kentucky classic, sage stands in for mint, and Meyer lemons are added for a unique winter cocktail. 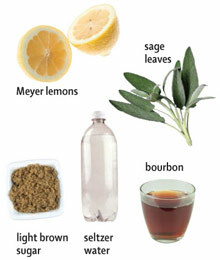 Make each drink individually by placing 10 sage leaf halves, 2 lemon quarters, and 1 Tbs. brown sugar in shaker. Mash together with muddler or back of spoon 30 seconds, or until aromatic. Add 4 ice cubes, and top with 2 oz. bourbon and 1 oz. seltzer. Shake well. Fill chilled tumbler with crushed ice. Strain julep mixture from shaker over ice, and garnish with Meyer lemon slice and sage leaf. Fresh carrot juice replaces tomato juice to create a bright, surprising take on the Bloody Mary, perfect for holiday brunch buffets. 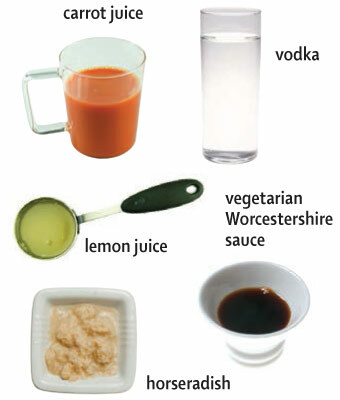 If you like your drinks spicy, add a few dashes of your favorite hot sauce.